Career felon Robert Payne is 58-years-old, yet he’s managed to be sentenced to a combined 56 years in prison for burglary over the past five decades. Scratch that. He has just been sentenced to prison again, bringing his combined burglary sentence to 83 years. 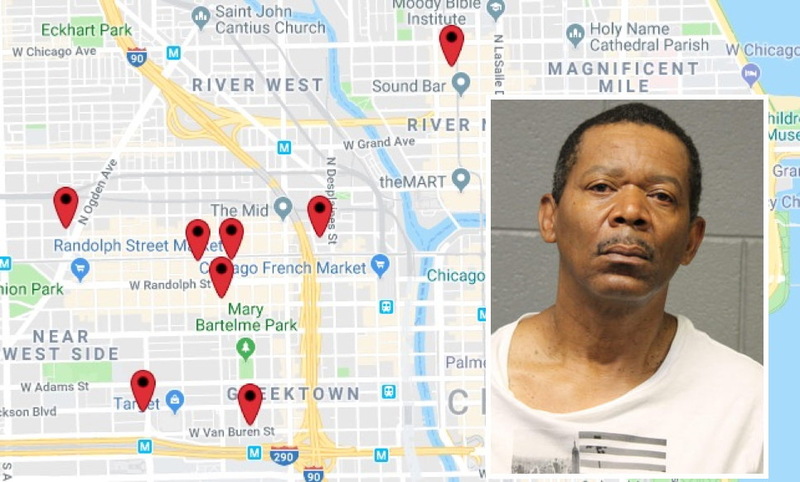 Payne picked up the latest sentence (three concurrent nine-year terms) when he pleaded guilty to a series of break-ins across the West Loop and Near North last week. Judge Nicholas Ford approved the plea deal. He was arrested on June 4th after cops went to a West Loop business to pick up a copy of surveillance video from a data recovery business that had reported an attempted break-in. As the officers were walking into the building, Payne was walking out. The officers said they immediately recognized him as the offender seen in surveillance footage from other burglarized businesses. They ran after Payne and arrested him at a bus stop in the 1300 block of West Van Buren. Payne was carrying a cordless grinder, two pry bars, two watches, seventeen gold rings, three silver rings, sixteen metal rings, and a West Loop attorney’s concealed carry licenses from three different states, according to police records. By the time investigators finished connecting the dots on a recent burglary spree, Payne was charged with ten counts of felony burglary and one count of felony attempted burglary. Among the businesses Payne was accused of burglarizing in the West Loop were: a computer-aided design shop; a day care center; a shared office space; a construction company; a freelance talent agency; a law firm; a cloud migration company; a trophy shop, a data recovery firm; and a school that specializes in social justice-based education. A video production company in River North was also listed as one of his victims. His next parole date has not been set. However, following the standard Illinois protocol of giving 50% off of sentences for anticipated good behavior, Payne will most likely be released in just over four years.